Can't ever have a drink. My skin just turned pink. Melting like ice every day. REALLY JUST LIKE - HOT HELL. Rusty water - rent and key. T.V. said, "ALL IS WELL". Soda - beer - have your fill. Doctor said, your getting ill.
Can't get off this earth. Poison water - another dead birth. 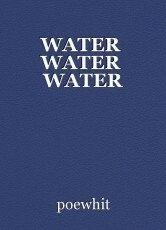 WATER - WATER - sing that song. Into The Abyss Of Eternity.